Yes, I could be confusing my days a bit! With the 3 day weekend I do feel like today could be Tuesday and when I saw this fun doorway over on Pinterest I just had to share! 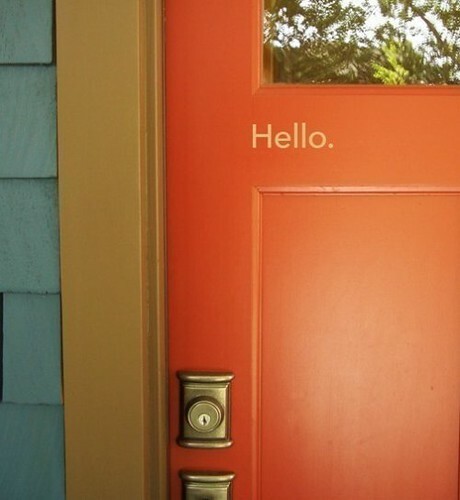 What a perfect way to welcome guests to your home, with a simple Hello!The only thing that would make this door even sweeter would be seeing the word "Thanks" as you leave the home! On another note how fabulous is this color combo of siding, molding and door? That's such a nice, warm greeting! Especially on the orange. Love it! Have you seen this door? Check out the frosted glass in the entry.